Showing of CLEOPATRA (1963) at the Dominion theatre in London. Licensed bars!!! 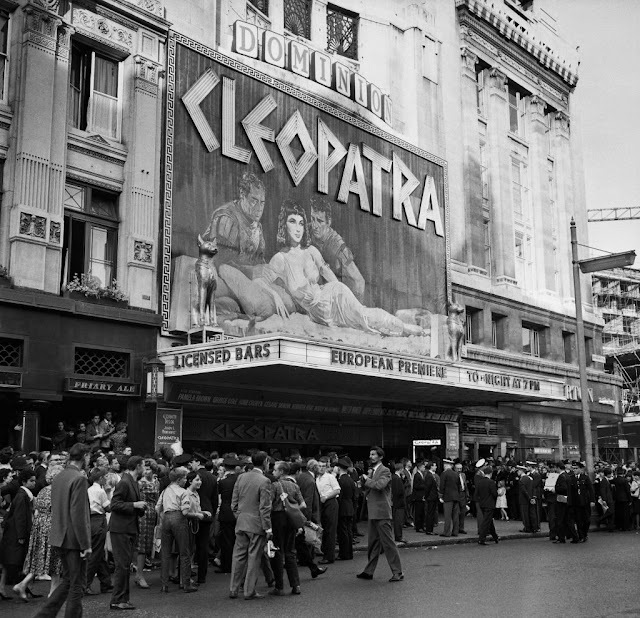 The Dominion Theater in London opened as a venue for plays, but later added facilities for showing movies. It was part of the UK nationwide Dominion chain. Surprisingly the Dominion Theater still exists, although part of its seating area has been closed. Reportedly its first class Art Deco interior plaster decoration is still intact. The fact that live performances can be held may explain the presence of bars (UK theaters have them). I saw this in Los Angeles when it first came out. I believe it played at the Cinerama Dome. There was a hardcover movie program that was sold in the box office (or the lobby). A visually fantastic film. As a young teenager I enjoyed the exotic locale, Burton's hubris and Taylor's cleavage!